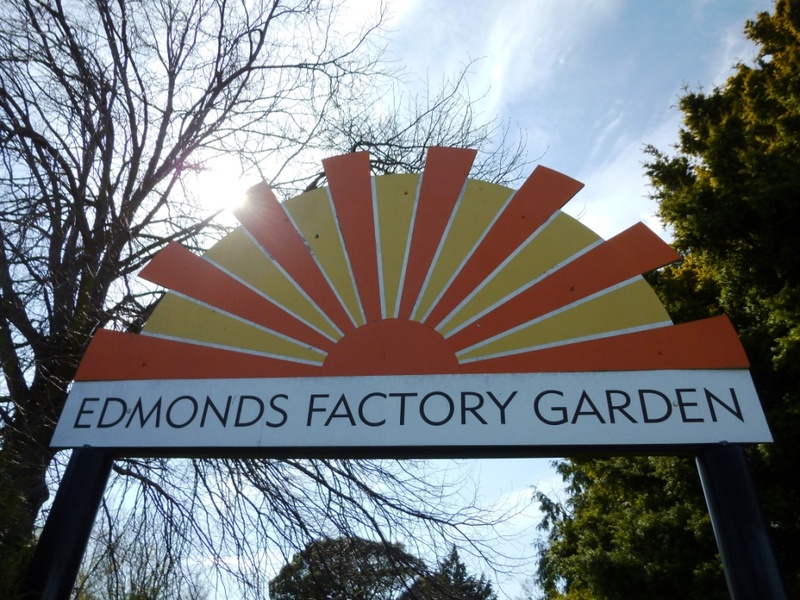 Pack a picnic – scones, pikelets, or some bacon & egg pie – and explore the lovely Edmonds Factory Garden (Ferry Road). If you’ve grown up with the Edmonds Cookery Book you might get warm fuzzies from the iconic ‘Sure to Rise’ emblem, which is cleverly incorporated throughout the gardens. The gardens are still beautifully mantained, largely by volunteers. There are pretty water features, pebbly paths to explore, and information boards for those interested in the history of the gardens. Heritage Week features Music at Edmonds – this year’s event is on Sunday 18th October 2015, 2-4 pm. It’s a good idea to use the gardens’ car park, which is accessible from Ferry Road. There’s also a small playground at the back of the gardens (by the car park), along with public toilets. See below for a map. We visited the Edmonds Factory Garden in September 2015 (spring). Path to the back of the garden. Playground at the back of gardens. Paved area with garden seats. Lots of Monarch butterflies on our visit. Car park off Ferry Road. Sure to Rise garden seat. The garden features on the cover of the best-selling Edmonds Cookery Book, and has been a popular horticultural delight for generations. Thomas Edmonds, the manufacturer of the famous brand of baking powder, commissioned this garden around his new factory, which was built in 1923. The gardens have won many awards in civic beautifying competitions and are a popular site for outdoor wedding photography. In the past, gardeners have been employed full-time to maintain the gardens. The City Council acquired a lot of the original Edmonds Factory Garden in 1991. The garden now has a more natural style with an emphasis on low maintenance. Friends of the Edmonds Factory Garden, a community group, work with the council to care for the garden. The Edmonds Factory Garden is on the corner of Ferry Road and Aldwins Road in Woolston – access the car park from Ferry Road.